ATLANTA — May 7, 2010 — Pizza Patrón’s new franchisee Armando del Bosque is photographed for a story in the May 7th edition of the Atlanta Business Chronicle newspaper, which caters to the business community in Atlanta. He is dressed in full Pizza Patrón regalia as he holds up a slice of a Patrona pizza. Pizza Patrón, America’s #1 Latin pizza brand, offers traditional pizza, wings and sides in its community based, Latin-influenced stores. 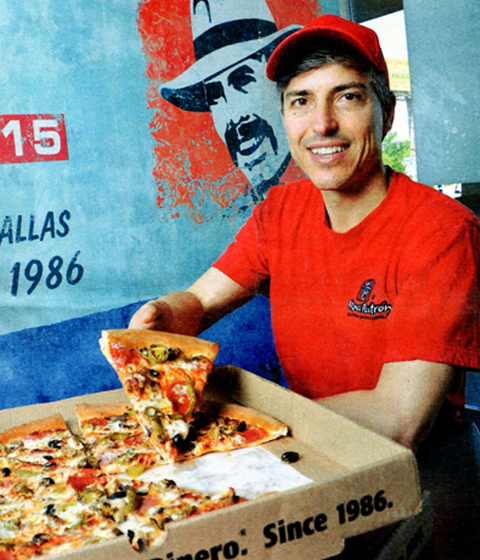 Pizza Patrón was founded by restaurateur Antonio Swad in 1986, in Dallas, Texas, and today operates 99 dine-in and carry-out restaurants in seven states with 40 more under development. Pizza Patrón has franchise opportunities available in prime markets throughout the country offering a proven system for hard-working franchisee candidates. In 2007, the brand received international news coverage when it decided to accept Mexican Pesos at all of its locations, gaining over 500,000,000 media impressions worth over $30 million in the U.S. alone. The company’s medium AMIGO PIZZAS® start as low as $4 and X-Large LISTA-NOW READY™ pepperoni pizzas start as low as $6 all day, every day.